whitney leigh morris welcomes a little one into the tiny canal cottage! My favorite part of putting together the nursery was finding all the little, practical details to use in the space while our son is an infant. A well-styled small space is one we can’t ignore, but add to that the fact that this small space is a small nursery, and consider us glued to our screens. Whitney Leigh Morris and her husbandAdam are expecting a baby boy (very) soon, and as they live in a now well-known tiny house, making room for baby in this already space-shy home was a top priority. There is no better person to tackle the task, and we asked Whitney to tell us how it all came together. Even before becoming pregnant, Adam and I knew we wanted to stay in our tiny house if we were able to have a baby. While it certainly took some brainstorming, it was truly no trouble to accommodate the nursery. It was such a pleasure to figure out how to best adapt our space, and I’ve loved bringing our plans to life. 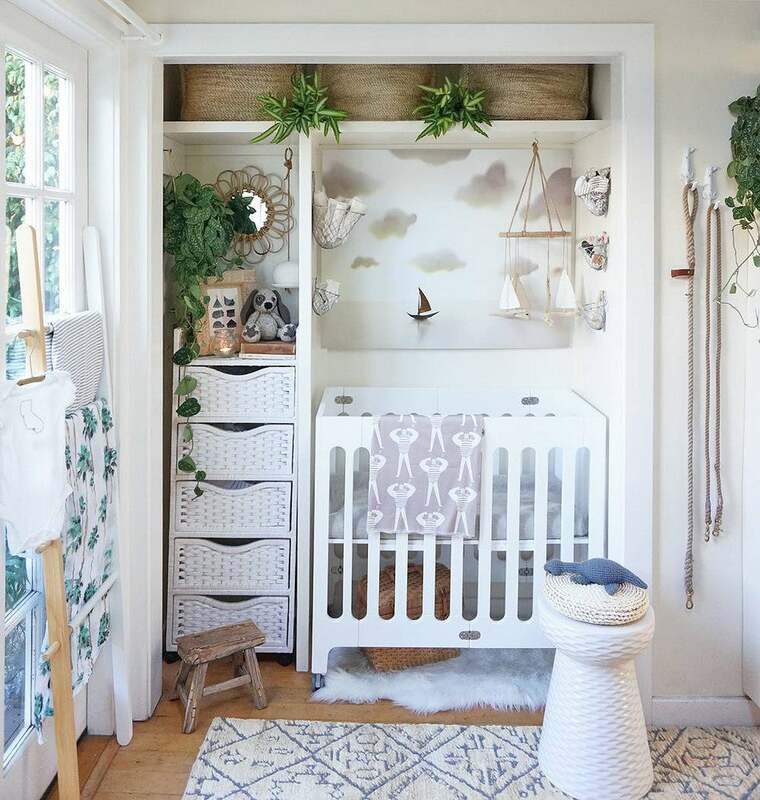 DID YOU IMMEDIATELY KNOW YOU WERE GOING TO GO FOR A CLOSET NURSERY? 1. Leave nearly everything as-is, but downsize our belongings in existing storage spaces to make room for baby care necessities, and rely solely on mobile/rolling nursery components. 2. Create a dedicated nursery within an existing space by downsizing and relocating our other belongings from that area. We opted for option two, because thanks to the dry SoCal climate we knew we could get creative with indoor/outdoor lifestyle and storage solutions. (If we lived somewhere that gets a fair amount of rain or any snow, we would’ve stuck with option one.) We decided to convert our bedroom closet into the nursery. We did this by downsizing substantially— now most of our clothes fit into the drawers that are built into the base and sides of the bed. We relocated the remaining elements of our wardrobe to a weather-proofed, customized 2’x4′ cedar garden shed from The Home Depot. DID YOU EVER THINK ABOUT MOVING TO A BIGGER SPACE? Not even for a moment. I do sometimes fantasize about making a few changes here— I miss having a tub and fireplace, and we’ve been dreaming of an outdoor shower. But we are just so happy here — I hope our son is, too. WHAT ADVICE DO YOU HAVE FOR NEW PARENTS WHO ARE WELCOMING A BABY INTO A TINY HOME? I’m sure I’ll be better-qualified to answer this question in October! But my number one tip is always to downsize your belongings. People constantly ask me for advice regarding clever storage solutions, and those are of course important. But you don’t need extensive storage if you don’t have too much stuff to begin with. Not only will getting rid of excessive items help you adapt your home for the baby and his/her necessities, but it will also free up precious minutes and hours within your day. You’ll spend less time cleaning, organizing and searching for things, and you’ll have more time to spend with your newest family member. WHAT INSPIRED THE NURSERY DESIGN? I didn’t intend to have a “theme” for the baby’s space, but it happened on its own over time. The colors, textures and prints I selected were sandy and neutral, and the artwork I loved most reminded us of our lives here by the water. Before I knew it, we had a subdued coastal vibe going on. WHAT WERE YOUR MAIN FUNCTIONALITY GOALS? Tiny house living can sometimes take a lot of Tetris-ing. But after spending so much time with my young nephews (who live in LA and visit the Cottage frequently,) I’ve learned that I will probably always have one hand on the baby, and won’t be able to rework our space as easily as I could in the past. As such, it was very important for us to make sure none of our belongings are crammed into corners or hard to reach places. We want everything to be easily accessible, while also being safely situated in case of earthquakes. WHAT WAS THE TOUGHEST GOAL TO ACHIEVE? I think that’s yet to come! I want to prove that realistic tiny living is possible with a family. Thus far, our biggest hurdle has not been internal— it’s actually been convincing others that we can do this. We’ve routinely had to (politely) remind folks that there are all types of living situations in this world, and that there’s no one “right way” or universal method that suits everyone. We’ve received numerous negative comments from well-intended acquaintances— input such as, “That will never work,” and “That won’t last long.” But the wonderful thing is that we can (and will) make it work in our own way. We look forward to the constant evolution of our space and our particular needs. I’m beyond excited about the growth of our family, and the changes it will inspire within our cheerful little home. HOUND HOOKS Vintage via ETSY ROPE LEASH Resq Co.
WHAT IS YOUR PERSONAL FAVORITE PART OF THE NURSERY? I love the feeling that the nursery gives me. Before, when it was our closet, I used to obsessively close the curtains, because the clutter and mess behind them stressed me out (and looked hideous). We’ve now curbed that clutter, and we have this bright and practical little alcove within the bedroom that radiates joy. It makes the entire home and garden feel complete. WHAT ARE YOU MOST LOOKING FORWARD TO ABOUT BRINGING A LITTLE ONE INTO YOUR TINY HOME? I know how sappy it sounds, but we are just so grateful and fulfilled here with each other. I am delighted to envelop a new life in that overflowing happiness. For me, it’s difficult to feel confident about bringing another person into a world filled with such ceaseless conflict. But our tiny home helps us balance our lives and maintain perspective. It inspires us to be pleased with less and appreciate more. It also encourages us to leave our bubble and get more entrenched within our community. I am looking forward to learning even more from it once our son is here.